GeoThings created a new handy Arduino compatible development board that provides both built-in GPS and mobile connectivity together with a few other features such as the ability to connect external batteries and solar panels. The GeoThings development board has been designed to offer users a cloud powered ultraslow consumption Arduino development board that offers easy Internet of things project development. GeoThings is a powerful platform for creating outdoor internet-connected sensors and hardware. It comes with a GPS, arduino-compatibility, solar power, and internet cloud connection. It takes your DIY projects to the next level and it’s a powerful tool for education and creativity. This little and lightweight board, ultra-low power consumption, solar powered contains a board microprocessor and a mobile microprocessor. It is fully arduino compatible and there are more than 200 compatible sensors. The GeoThings project is currently over on the Kickstarter crowd funding website looking to raise $190,000 in pledges to make the jump from concept to production. If you making Arduino projects you may enjoy building your very own Arduino wind speed meter that requires just basic Arduino skills. 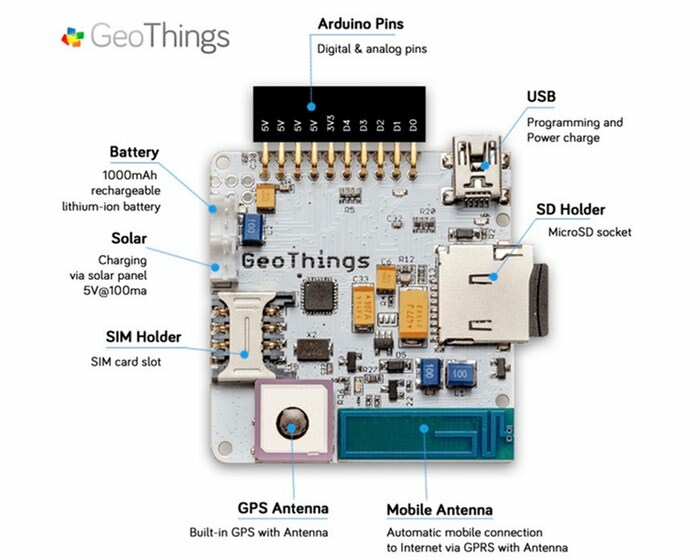 So if you think GeoThings is something your next project could benefit from, visit the Kickstarter website now to make a pledge from $59 and help the GeoThings board become a reality.